This article is about the bacteria. For the disease caused by such bacteria, see Salmonellosis. Salmonella species are non-spore-forming, predominantly motile enterobacteria with cell diameters between about 0.7 and 1.5 µm, lengths from 2 to 5 µm, and peritrichous flagella (all around the cell body). They are chemotrophs, obtaining their energy from oxidation and reduction reactions using organic sources. They are also facultative aerobes, capable of generating ATP with oxygen ("aerobically") when it is available, or when oxygen is not available, using other electron acceptors or fermentation ("anaerobically"). S. enterica subspecies are found worldwide in all warm-blooded animals and in the environment. S. bongori is restricted to cold-blooded animals, particularly reptiles. Salmonella species are intracellular pathogens; certain serotypes cause illness. Nontyphoidal serotypes can be transferred from animal-to-human and from human-to-human. They usually invade only the gastrointestinal tract and cause salmonellosis, the symptoms of which can be resolved without antibiotics. However, in sub-Saharan Africa, nontyphoidal Salmonella can be invasive and cause paratyphoid fever, which requires immediate treatment with antibiotics. Typhoidal serotypes can only be transferred from human-to-human, and can cause food-borne infection, typhoid fever, and paratyphoid fever. Typhoid fever is caused by Salmonella invading the bloodstream (the typhoidal form), or in addition spreads throughout the body, invades organs, and secretes endotoxins (the septic form). This can lead to life-threatening hypovolemic shock and septic shock, and requires intensive care including antibiotics. The genus Salmonella is part of the family of Enterobacteriaceae. Its taxonomy has been revised and has the potential to confuse. The genus comprises two species, S. bongori and S. enterica, the latter of which is divided into six subspecies: S. e. enterica, S. e. salamae, S. e. arizonae, S. e. diarizonae, S. e. houtenae, and S. e. indica. The taxonomic group contains more than 2500 serotypes (also serovars) defined on the basis of the somatic O (lipopolysaccharide) and flagellar H antigens (the Kauffman–White classification). The full name of a serotype is given as, for example, Salmonella enterica subsp. enterica serotype Typhimurium, but can be abbreviated to Salmonella Typhimurium. Further differentiation of strains to assist clinical and epidemiological investigation may be achieved by antibiotic sensitivity testing and by other molecular biology techniques such as pulsed-field gel electrophoresis, multilocus sequence typing, and, increasingly, whole genome sequencing. Historically, salmonellae have been clinically categorized as invasive (typhoidal) or noninvasive (nontyphoidal salmonellae) based on host preference and disease manifestations in humans. Most subspecies of Salmonella produce hydrogen sulfide, which can readily be detected by growing them on media containing ferrous sulfate, such as is used in the triple sugar iron test. Most isolates exist in two phases, a motile phase I and a nonmotile phase II. Cultures that are nonmotile upon primary culture may be switched to the motile phase using a Craigie tube or ditch plate. RVS broth can be used to enrich for Salmonella species for detection in a clinical sample. Salmonella species lead predominantly host-associated lifestyles, but the bacteria were found to be able to persist in a bathroom setting for weeks following contamination, and are frequently isolated from water sources, which act as bacterial reservoirs and may help to facilitate transmission between hosts. Salmonella is notorious for its ability to survive desiccation and can persist for years in dry environments and foods. The bacteria are not destroyed by freezing, but UV light and heat accelerate their destruction. They perish after being heated to 55 °C (131 °F) for 90 min, or to 60 °C (140 °F) for 12 min. To protect against Salmonella infection, heating food for at least 10 minutes to an internal temperature of 75 °C (167 °F) is recommended. Initially, each Salmonella "species" was named according to clinical considerations, for example Salmonella typhi-murium (mouse typhoid fever), S. cholerae-suis. After host specificity was recognized to not exist for many species, new strains received species names according to the location at which the new strain was isolated. Later, molecular findings led to the hypothesis that Salmonella consisted of only one species, S. enterica, and the serotypes were classified into six groups, two of which are medically relevant. As this now-formalized nomenclature is not in harmony with the traditional usage familiar to specialists in microbiology and infectologists, the traditional nomenclature is still common. Currently, the two recognized species are S. enterica, and S. bongori. 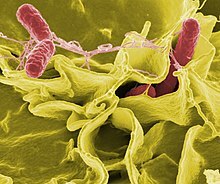 In 2005, a third species, Salmonella subterranean, was proposed, but according to the World Health Organization, the bacterium reported does not belong in the genus Salmonella. The six main recognised subspecies are: enterica (serotype I), salamae (serotype II), arizonae (IIIa), diarizonae (IIIb), houtenae (IV), and indica (VI). The former serotype (V) was bongori, which is now considered its own species. The serotype or serovar, is a classification of Salmonella into subspecies based on antigens that the organism presents. It is based on the Kauffman-White classification scheme that differentiates serological varieties from each other. Serotypes are usually put into subspecies groups after the genus and species, with the serotypes/serovars capitalized, but not italicized: An example is Salmonella enterica serovar Typhimurium. More modern approaches for typing and subtyping Salmonella include DNA-based methods such as pulsed field gel electrophoresis, multiple-loci VNTR analysis, multilocus sequence typing, and multiplex-PCR-based methods. Salmonella species are facultative intracellular pathogens. A facultative organism uses oxygen to make ATP; when it is not available, it "exercises its option"—the literal meaning of the term—and makes ATP by fermentation, or by substituting one or more of four less efficient electron acceptors as oxygen at the end of the electron transport chain: sulfate, nitrate, sulfur, or fumarate. Most infections are due to ingestion of food contaminated by animal feces, or by human feces, such as by a food-service worker at a commercial eatery. Salmonella serotypes can be divided into two main groups—typhoidal and nontyphoidal. Nontyphoidal serotypes are more common, and usually cause self-limiting gastrointestinal disease. They can infect a range of animals, and are zoonotic, meaning they can be transferred between humans and other animals. Typhoidal serotypes include Salmonella Typhi and Salmonella Paratyphi A, which are adapted to humans and do not occur in other animals. Infection with nontyphoidal serotypes of Salmonella generally results in food poisoning. Infection usually occurs when a person ingests foods that contain a high concentration of the bacteria. Infants and young children are much more susceptible to infection, easily achieved by ingesting a small number of bacteria. In infants, infection through inhalation of bacteria-laden dust is possible. The organisms enter through the digestive tract and must be ingested in large numbers to cause disease in healthy adults. An infection can only begin after living salmonellae (not merely Salmonella-produced toxins) reach the gastrointestinal tract. Some of the microorganisms are killed in the stomach, while the surviving ones enter the small intestine and multiply in tissues. Gastric acidity is responsible for the destruction of the majority of ingested bacteria, but Salmonella has evolved a degree of tolerance to acidic environments that allows a subset of ingested bacteria to survive. Bacterial colonies may also become trapped in mucus produced in the esophagus. By the end of the incubation period, the nearby host cells are poisoned by endotoxins released from the dead salmonellae. The local response to the endotoxins is enteritis and gastrointestinal disorder. While in developed countries, nontyphoidal serotypes present mostly as gastrointestinal disease, in sub-Saharan Africa, these serotypes can create a major problem in bloodstream infections, and are the most commonly isolated bacteria from the blood of those presenting with fever. Bloodstream infections caused by nontyphoidal salmonellae in Africa were reported in 2012 to have a case fatality rate of 20–25%. Most cases of invasive nontyphoidal salmonella infection (iNTS) are caused by S. typhimurium or S. enteritidis. A new form of Salmonella typhimurium (ST313) emerged in the southeast of the African continent 75 years ago, followed by a second wave which came out of central Africa 18 years later. This second wave of iNTS possibly originated in the Congo Basin, and early in the event picked up a gene that made it resistant to the antibiotic chloramphenicol. This created the need to use expensive antimicrobial drugs in areas of Africa that were very poor, making treatment difficult. The increased prevalence of iNTS in sub-Saharan Africa compared to other regions is thought to be due to the large proportion of the African population with some degree of immune suppression or impairment due to the burden of HIV, malaria, and malnutrition, especially in children. The genetic makeup of iNTS is evolving into a more typhoid-like bacterium, able to efficiently spread around the human body. Symptoms are reported to be diverse, including fever, hepatosplenomegaly, and respiratory symptoms, often with an absence of gastrointestinal symptoms. Typhoid fever is caused by Salmonella serotypes which are strictly adapted to humans or higher primates—these include Salmonella typhi, Paratyphi A, Paratyphi B, and Paratyphi C. In the systemic form of the disease, salmonellae pass through the lymphatic system of the intestine into the blood of the patients (typhoid form) and are carried to various organs (liver, spleen, kidneys) to form secondary foci (septic form). Endotoxins first act on the vascular and nervous apparatus, resulting in increased permeability and decreased tone of the vessels, upset of thermal regulation, and vomiting and diarrhoea. In severe forms of the disease, enough liquid and electrolytes are lost to upset the water-salt metabolism, decrease the circulating blood volume and arterial pressure, and cause hypovolemic shock. Septic shock may also develop. Shock of mixed character (with signs of both hypovolemic and septic shock) is more common in severe salmonellosis. Oliguria and azotemia may develop in severe cases as a result of renal involvement due to hypoxia and toxemia. In Germany, food-borne infections must be reported. From 1990 to 2016, the number of officially recorded cases decreased from about 200,000 to about 13,000 cases. In the United States, about 1,200,000 cases of Salmonella infection are estimated to occur each year. A World Health Organization study estimated that 21,650,974 cases of typhoid fever occurred in 2000, 216,510 of which resulted in death, along with 5,412,744 cases of paratyphoid fever. Mechanisms of infection differ between typhoidal and nontyphoidal serotypes, owing to their different targets in the body and the different symptoms that they cause. Both groups must enter by crossing the barrier created by the intestinal cell wall, but once they have passed this barrier, they use different strategies to cause infection. Nontyphoidal serotypes preferentially enter M cells on the intestinal wall by bacterial-mediated endocytosis, a process associated with intestinal inflammation and diarrhoea. They are also able to disrupt tight junctions between the cells of the intestinal wall, impairing the cells' ability to stop the flow of ions, water, and immune cells into and out of the intestine. The combination of the inflammation caused by bacterial-mediated endocytosis and the disruption of tight junctions is thought to contribute significantly to the induction of diarrhoea. Salmonellae are also able to breach the intestinal barrier via phagocytosis and trafficking by CD18-positive immune cells, which may be a mechanism key to typhoidal Salmonella infection. This is thought to be a more stealthy way of passing the intestinal barrier, and may, therefore, contribute to the fact that lower numbers of typhoidal Salmonella are required for infection than nontyphoidal Salmonella. Salmonella cells are able to enter macrophages via macropinocytosis. Typhoidal serotypes can use this to achieve dissemination throughout the body via the mononuclear phagocyte system, a network of connective tissue that contains immune cells, and surrounds tissue associated with the immune system throughout the body. Much of the success of Salmonella in causing infection is attributed to two type III secretion systems which function at different times during an infection. One is required for the invasion of nonphagocytic cells, colonization of the intestine, and induction of intestinal inflammatory responses and diarrhea. The other is important for survival in macrophages and establishment of systemic disease. These systems contain many genes which must work co-operatively to achieve infection. Salmonellosis is known to be able to cause back pain or spondylosis. It can manifest as five clinical patterns: gastrointestinal tract infection, enteric fever, bacteremia, local infection, and the chronic reservoir state. The initial symptoms are nonspecific fever, weakness, and myalgia among others. In the bacteremia state, it can spread to any parts of the body and this induces localized infection or it forms abscesses. The forms of localized Salmonella infections are arthritis, urinary tract infection, infection of the central nervous system, bone infection, soft tissue infection, etc. Infection may remain as the latent form for a long time, and when the function of reticular endothelial cells is deteriorated, it may become activated and consequently, it may secondarily induce spreading infection in the bone several months or several years after acute salmonellosis. A 2018 Imperial College London study shows how salmonella disrupt specific arms of the immune system (e.g. 3 of 5 NF-kappaB proteins) using a family of zinc metalloproteinase effectors, leaving others untouched. A hallmark of Salmonella pathogenesis is the ability of the bacterium to survive and proliferate within phagocytes. Phagocytes produce DNA-damaging agents such as nitric oxide and oxygen radicals as a defense against pathogens. Thus, Salmonella species must face attack by molecules that challenge genome integrity. Buchmeier et al. showed that mutants of S. enterica lacking RecA or RecBC protein function are highly sensitive to oxidative compounds synthesized by macrophages, and furthermore these findings indicate that successful systemic infection by S. enterica requires RecA- and RecBC-mediated recombinational repair of DNA damage. S. enterica, through some of its serotypes such as Typhimurium and Enteriditis, shows signs of the ability to infect several different mammalian host species, while other serotypes such as Typhi seem to be restricted to only a few hosts. Some of the ways that Salmonella serotypes have adapted to their hosts include loss of genetic material and mutation. In more complex mammalian species, immune systems, which include pathogen specific immune responses, target serovars of Salmonella through binding of antibodies to structures such as flagella. Through the loss of the genetic material that codes for a flagellum to form, Salmonella can evade a host's immune system. mgtC leader RNA from bacteria virulence gene (mgtCBR operon) decreases flagellin production during infection by directly base pairing with mRNAs of the fljB gene encoding flagellin and promotes degradation. In the study by Kisela et al., more pathogenic serovars of S. enterica were found to have certain adhesins in common that have developed out of convergent evolution. This means that, as these strains of Salmonella have been exposed to similar conditions such as immune systems, similar structures evolved separately to negate these similar, more advanced defenses in hosts. Still, many questions remain about the way that Salmonella has evolved into so many different types, but Salmonella may have evolved through several phases. As Baumler et al. have suggested, Salmonella most likely evolved through horizontal gene transfer, formation of new serovars due to additional pathogenicity islands. and an approximation of its ancestry. So, Salmonella could have evolved into its many different serotypes through gaining genetic information from different pathogenic bacteria. The presence of several pathogenicity islands in the genome of different serotypes has lent credence to this theory. Salmonella sv. Newport has signs of adaptation to a plant colonization lifestyle, which may play a role in its disproportionate association with foodborne illness linked to produce. A variety of functions selected for during sv. Newport persistence in tomatoes have been reported to be similar to those selected for in sv. Typhimurium from animal hosts. The papA gene, which is unique to sv. Newport, contributes to the strain's fitness in tomatoes, and has homologs in genomes of other Enterobacteriaceae that are able to colonize plant and animal hosts. In addition to its importance as a pathogen, S. enterica serovar Typhimurium has been instrumental in the development of genetic tools that led to an understanding of fundamental bacterial physiology. These developments were enabled by the discovery of the first generalized transducing phage, P22, in Typhimurium that allowed quick and easy genetic exchange that allowed fine structure genetic analysis. The large number of mutants led to a revision of genetic nomenclature for bacteria. Many of the uses of transposons as genetic tools, including transposon delivery, mutagenesis, construction of chromosome rearrangements, were also developed in Typhimurium. These genetic tools also led to a simple test for carcinogens, the Ames test. ^ "Salmonella" (HTML). NCBI taxonomy. Bethesda, MD: National Center for Biotechnology Information. Retrieved 27 January 2019. ^ Su LH, Chiu CH (2007). "Salmonella: clinical importance and evolution of nomenclature". Chang Gung Medical Journal. 30 (3): 210–9. PMID 17760271. ^ Gal-Mor O, Boyle EC, Grassl GA (2014). "Same species, different diseases: how and why typhoidal and non-typhoidal Salmonella enterica serovars differ". Frontiers in Microbiology. 5: 391. doi:10.3389/fmicb.2014.00391. PMC 4120697. PMID 25136336. ^ a b Fàbrega A, Vila J (April 2013). "Salmonella enterica serovar Typhimurium skills to succeed in the host: virulence and regulation". Clinical Microbiology Reviews. 26 (2): 308–41. doi:10.1128/CMR.00066-12. PMC 3623383. PMID 23554419. ^ Tortora GA (2008). Microbiology: An Introduction] (9th ed.). Pearson. pp. 323–324. ISBN 978-8131722329. ^ a b Jantsch J, Chikkaballi D, Hensel M (March 2011). "Cellular aspects of immunity to intracellular Salmonella enterica". Immunological Reviews. 240 (1): 185–95. doi:10.1111/j.1600-065X.2010.00981.x. PMID 21349094. ^ Ryan I KJ, Ray CG, eds. (2004). Sherris Medical Microbiology (4th ed.). McGraw Hill. pp. 362–8. ISBN 978-0-8385-8529-0. ^ Brenner FW, Villar RG, Angulo FJ, Tauxe R, Swaminathan B (July 2000). "Salmonella nomenclature". Journal of Clinical Microbiology. 38 (7): 2465–7. PMC 86943. PMID 10878026. ^ editors, Gillespie SH, Hawkey PM (2006). Principles and practice of clinical bacteriology (2nd ed.). Hoboken, NJ: John Wiley & Sons. ISBN 9780470017968. ^ Okoro CK, Kingsley RA, Connor TR, Harris SR, Parry CM, Al-Mashhadani MN, Kariuki S, Msefula CL, Gordon MA, de Pinna E, Wain J, Heyderman RS, Obaro S, Alonso PL, Mandomando I, MacLennan CA, Tapia MD, Levine MM, Tennant SM, Parkhill J, Dougan G (November 2012). "Intracontinental spread of human invasive Salmonella Typhimurium pathovariants in sub-Saharan Africa". Nature Genetics. 44 (11): 1215–21. doi:10.1038/ng.2423. PMC 3491877. PMID 23023330. ^ Eberth, Prof C. J. (1880-07-01). "Die Organismen in den Organen bei Typhus abdominalis". Archiv für Pathologische Anatomie und Physiologie und für Klinische Medizin (in German). 81 (1): 58–74. doi:10.1007/BF01995472. ISSN 0720-8723. ^ Hardy A (August 1999). "Food, hygiene, and the laboratory. A short history of food poisoning in Britain, circa 1850-1950". Social History of Medicine. 12 (2): 293–311. doi:10.1093/shm/12.2.293. PMID 11623930. ^ "FDA/CFSAN—Food Safety A to Z Reference Guide—Salmonella". FDA–Center for Food Safety and Applied Nutrition. 2008-07-03. Archived from the original on 2009-03-02. Retrieved 2009-02-14. ^ a b Heymann DA, Alcamo IE, Heymann DL (2006). Salmonella. Philadelphia: Chelsea House Publishers. ISBN 978-0-7910-8500-4. Retrieved 31 July 2015. ^ Clark MA, Barret EL (June 1987). "The phs gene and hydrogen sulfide production by Salmonella typhimurium". Journal of Bacteriology. 169 (6): 2391–2397. doi:10.1128/jb.169.6.2391-2397.1987. PMC 212072. PMID 3108233. ^ "UK Standards for Microbiology Investigations: Changing the Phase of Salmonella" (PDF). UK Standards for Microbiology Investigations: 8–10. 8 January 2015. Retrieved 2 August 2015. ^ Snyder JW, Atlas RM (2006). Handbook of Media for Clinical Microbiology. CRC Press. p. 374. ISBN 978-0849337956. ^ Alvarez J, Sota M, Vivanco AB, Perales I, Cisterna R, Rementeria A, Garaizar J (April 2004). "Development of a multiplex PCR technique for detection and epidemiological typing of salmonella in human clinical samples". Journal of Clinical Microbiology. 42 (4): 1734–8. doi:10.1128/JCM.42.4.1734-1738.2004. PMC 387595. PMID 15071035. ^ Hoorfar J, Ahrens P, Rådström P (September 2000). "Automated 5' nuclease PCR assay for identification of Salmonella enterica". Journal of Clinical Microbiology. 38 (9): 3429–35. PMC 87399. PMID 10970396. ^ Dominguez, Silvia A. "Modelling the Growth of Salmonella in Raw Poultry Stored under Aerobic Conditions". ^ Pin C, Avendaño-Perez G, Cosciani-Cunico E, Gómez N, Gounadakic A, Nychas GJ, Skandamis P, Barker G (March 2011). "Modelling Salmonella concentration throughout the pork supply chain by considering growth and survival in fluctuating conditions of temperature, pH and a(w)". International Journal of Food Microbiology. 145 Suppl 1: S96–102. doi:10.1016/j.ijfoodmicro.2010.09.025. PMID 20951457. ^ Pan W. "Modelling the Growth of Salmonella in Cut Red Round Tomatoes as a Function of Temperature". ^ Li D, Friedrich LM, Danyluk MD, Harris LJ, Schaffner DW (June 2013). "Development and validation of a mathematical model for growth of pathogens in cut melons". Journal of Food Protection. 76 (6): 953–8. doi:10.4315/0362-028X.JFP-12-398. PMID 23726189. ^ Li D. "Development and validation of a mathematical model for growth of salmonella in cantaloupe". ^ Winfield MD, Groisman EA (July 2003). "Role of nonhost environments in the lifestyles of Salmonella and Escherichia coli". Applied and Environmental Microbiology. 69 (7): 3687–94. doi:10.1128/aem.69.7.3687-3694.2003. PMC 165204. PMID 12839733. ^ Mandal RK, Kwon YM (8 September 2017). "Salmonella entericaSerovar Typhimurium Genes for Desiccation Survival". Frontiers in Microbiology. 8 (1723): 1723. doi:10.3389/fmicb.2017.01723. PMC 5596212. PMID 28943871. ^ Sorrells KM, Speck ML, Warren JA (January 1970). "Pathogenicity of Salmonella gallinarum after metabolic injury by freezing". Applied Microbiology. 19 (1): 39–43. PMC 376605. PMID 5461164. Mortality differences between wholly uninjured and predominantly injured populations were small and consistent (5% level) with a hypothesis of no difference. ^ Beuchat LR, Heaton EK (June 1975). "Salmonella survival on pecans as influenced by processing and storage conditions". Applied Microbiology. 29 (6): 795–801. PMC 187082. PMID 1098573. Little decrease in viable population of the three species was noted on inoculated pecan halves stored at -18, -7, and 5°C for 32 weeks. ^ Goodfellow SJ, Brown WL (August 1978). "Fate of Salmonella Inoculated into Beef for Cooking". Journal of Food Protection. 41 (8): 598–605. doi:10.4315/0362-028x-41.8.598. ^ Partnership for Food Safety Education (PFSE) Fight BAC! Basic Brochure Archived 2013-08-31 at the Wayback Machine. ^ USDA Internal Cooking Temperatures Chart Archived 2012-05-03 at the Wayback Machine. The USDA has other resources available at their Safe Food Handling Archived 2013-06-05 at the Wayback Machine fact-sheet page. See also the National Center for Home Food Preservation. ^ "Reptiles, Amphibians, and Salmonella". Centers for Disease Control and Prevention. U.S. Department of Health & Human Services. 25 November 2013. Retrieved 3 August 2013. ^ a b Goldrick, Barbara (2003). "Foodborne Diseases: More efforts needed to meet the Healthy People 2010 objectives". The American Journal of Nursing. 103 (3): 105–106. doi:10.1097/00000446-200303000-00043. Retrieved 6 December 2014. ^ Le ML, Popoff MY (1987). "Request for an Opinion. Designation of Salmonella enterica. sp. nov., nom. rev., as the type and only species of the genus Salmonella". Int. J. Syst. Bacteriol. 37 (4): 465–468. doi:10.1099/00207713-37-4-465. ^ Reeves MW, Evins GM, Heiba AA, Plikaytis BD, Farmer JJ (February 1989). "Clonal nature of Salmonella typhi and its genetic relatedness to other salmonellae as shown by multilocus enzyme electrophoresis, and proposal of Salmonella bongori comb. nov". Journal of Clinical Microbiology. 27 (2): 313–20. PMC 267299. PMID 2915026. ^ Judicial Commission of the International Committee on Systematics of Prokaryotes (January 2005). "The type species of the genus Salmonella Lignieres 1900 is Salmonella enterica (ex Kauffmann and Edwards 1952) Le Minor and Popoff 1987, with the type strain LT2T, and conservation of the epithet enterica in Salmonella enterica over all earlier epithets that may be applied to this species. Opinion 80". International Journal of Systematic and Evolutionary Microbiology. 55 (Pt 1): 519–20. doi:10.1099/ijs.0.63579-0. PMID 15653929. ^ Tindall BJ, Grimont PA, Garrity GM, Euzéby JP (January 2005). "Nomenclature and taxonomy of the genus Salmonella". International Journal of Systematic and Evolutionary Microbiology. 55 (Pt 1): 521–4. doi:10.1099/ijs.0.63580-0. PMID 15653930. ^ Grimont PA, Xavier Weill F (2007). Antigenic Formulae of the Salmonella Serovars (PDF) (9th ed.). Institut Pasteur, Paris, France: WHO Collaborating Centre for Reference and Research on Salmonella. p. 7. Retrieved 26 August 2015. ^ Porwollik S, ed. (2011). Salmonella: From Genome to Function. Caister Academic Press. ISBN 978-1-904455-73-8. ^ Achtman M, Wain J, Weill FX, Nair S, Zhou Z, Sangal V, Krauland MG, Hale JL, Harbottle H, Uesbeck A, Dougan G, Harrison LH, Brisse S, S. Enterica MLST Study Group (2012). "Multilocus sequence typing as a replacement for serotyping in Salmonella enterica". PLoS Pathogens. 8 (6): e1002776. doi:10.1371/journal.ppat.1002776. PMC 3380943. PMID 22737074. ^ Garcia-del Portillo F, Foster JW, Finlay BB (October 1993). "Role of acid tolerance response genes in Salmonella typhimurium virulence". Infection and Immunity. 61 (10): 4489–92. PMC 281185. PMID 8406841. ^ Feasey NA, Dougan G, Kingsley RA, Heyderman RS, Gordon MA (June 2012). "Invasive non-typhoidal salmonella disease: an emerging and neglected tropical disease in Africa". Lancet. 379 (9835): 2489–99. doi:10.1016/S0140-6736(11)61752-2. PMC 3402672. PMID 22587967. ^ "Anzahl der jährlich registrierten Salmonellose-Erkrankungen in Deutschland bis 2016 | Statistik". ^ Crump JA, Luby SP, Mintz ED (May 2004). "The global burden of typhoid fever". Bulletin of the World Health Organization. 82 (5): 346–53. PMC 2622843. PMID 15298225. ^ a b c d Haraga A, Ohlson MB, Miller SI (January 2008). "Salmonellae interplay with host cells". Nature Reviews. Microbiology. 6 (1): 53–66. doi:10.1038/nrmicro1788. PMID 18026123. ^ Kerr MC, Wang JT, Castro NA, Hamilton NA, Town L, Brown DL, Meunier FA, Brown NF, Stow JL, Teasdale RD (April 2010). "Inhibition of the PtdIns(5) kinase PIKfyve disrupts intracellular replication of Salmonella". The EMBO Journal. 29 (8): 1331–47. doi:10.1038/emboj.2010.28. PMC 2868569. PMID 20300065. ^ Mittal R, Peak-Chew SY, Sade RS, Vallis Y, McMahon HT (June 2010). "The acetyltransferase activity of the bacterial toxin YopJ of Yersinia is activated by eukaryotic host cell inositol hexakisphosphate". The Journal of Biological Chemistry. 285 (26): 19927–34. doi:10.1074/jbc.M110.126581. PMC 2888404. PMID 20430892. ^ a b Choi YS, Cho WJ, Yun SH, Lee SY, Park SH, Park JC, Jang EH, Shin HY (December 2010). "A case of back pain caused by Salmonella spondylitis -A case report-". Korean Journal of Anesthesiology. 59 Suppl: S233–7. doi:10.4097/kjae.2010.59.S.S233. PMC 3030045. PMID 21286449. ^ "Bacterial protein mimics DNA to sabotage cells' defenses: Study reveals details of Salmonella infections". ^ a b Buchmeier NA, Lipps CJ, So MY, Heffron F (March 1993). "Recombination-deficient mutants of Salmonella typhimurium are avirulent and sensitive to the oxidative burst of macrophages". Molecular Microbiology. 7 (6): 933–6. doi:10.1111/j.1365-2958.1993.tb01184.x. PMID 8387147. ^ Cano DA, Pucciarelli MG, García-del Portillo F, Casadesús J (January 2002). "Role of the RecBCD recombination pathway in Salmonella virulence". Journal of Bacteriology. 184 (2): 592–5. doi:10.1128/jb.184.2.592-595.2002. PMC 139588. PMID 11751841. ^ Thomson NR, Clayton DJ, Windhorst D, Vernikos G, Davidson S, Churcher C, Quail MA, Stevens M, Jones MA, Watson M, Barron A, Layton A, Pickard D, Kingsley RA, Bignell A, Clark L, Harris B, Ormond D, Abdellah Z, Brooks K, Cherevach I, Chillingworth T, Woodward J, Norberczak H, Lord A, Arrowsmith C, Jagels K, Moule S, Mungall K, Sanders M, Whitehead S, Chabalgoity JA, Maskell D, Humphrey T, Roberts M, Barrow PA, Dougan G, Parkhill J (October 2008). "Comparative genome analysis of Salmonella Enteritidis PT4 and Salmonella Gallinarum 287/91 provides insights into evolutionary and host adaptation pathways". Genome Research. 18 (10): 1624–37. doi:10.1101/gr.077404.108. PMC 2556274. PMID 18583645. ^ den Bakker HC, Moreno Switt AI, Govoni G, Cummings CA, Ranieri ML, Degoricija L, Hoelzer K, Rodriguez-Rivera LD, Brown S, Bolchacova E, Furtado MR, Wiedmann M (August 2011). "Genome sequencing reveals diversification of virulence factor content and possible host adaptation in distinct subpopulations of Salmonella enterica". BMC Genomics. 12: 425. doi:10.1186/1471-2164-12-425. PMC 3176500. PMID 21859443. ^ Choi E, Han Y, Cho YJ, Nam D, Lee EJ (September 2017). "Salmonellavirulence gene". Proceedings of the National Academy of Sciences of the United States of America. 114 (38): 10232–10237. doi:10.1073/pnas.1705437114. PMC 5617274. PMID 28874555. ^ Kisiela DI, Chattopadhyay S, Libby SJ, Karlinsey JE, Fang FC, Tchesnokova V, Kramer JJ, Beskhlebnaya V, Samadpour M, Grzymajlo K, Ugorski M, Lankau EW, Mackie RI, Clegg S, Sokurenko EV (2012). "Evolution of Salmonella enterica virulence via point mutations in the fimbrial adhesin". PLoS Pathogens. 8 (6): e1002733. doi:10.1371/journal.ppat.1002733. PMC 3369946. PMID 22685400. ^ a b Bäumler AJ, Tsolis RM, Ficht TA, Adams LG (October 1998). "Evolution of host adaptation in Salmonella enterica". Infection and Immunity. 66 (10): 4579–87. PMC 108564. PMID 9746553. ^ a b de Moraes MH, Soto EB, Salas González I, Desai P, Chu W, Porwollik S, McClelland M, Teplitski M (2018). "Salmonella sv. Newport to a Plant Colonization Lifestyle". Frontiers in Microbiology. 9: 877. doi:10.3389/fmicb.2018.00877. PMC 5968271. PMID 29867794. ^ Zinder ND, Lederberg J (November 1952). "Genetic exchange in Salmonella" (PDF). Journal of Bacteriology. 64 (5): 679–99. PMC 169409. PMID 12999698. ^ Demerec M, Adelberg EA, Clark AJ, Hartman PE (July 1966). "A proposal for a uniform nomenclature in bacterial genetics" (PDF). Genetics. 54 (1): 61–76. PMC 1211113. PMID 5961488. ^ Ames BN, Mccann J, Yamasaki E (December 1975). "Methods for detecting carcinogens and mutagens with the Salmonella/mammalian-microsome mutagenicity test". Mutation Research. 31 (6): 347–64. doi:10.1016/0165-1161(75)90046-1. PMID 768755.